The Holocaust Center has been holding a community-wide commemoration since the establishment of the Center in 1980. The commemoration includes a candle-lighting ceremony. Six candles are lit in memory of the six million and two additional candles are lit in honor of the Righteous and the Liberators – – those non-Jews who risked their lives to save the lives of their Jewish friends and neighbors. The candle-lighters comprise of local survivors, community members, and lay leaders who have a connection to the year’s topic. This Year’s Yom HaShoah commemoration will honor local survivors and their families. 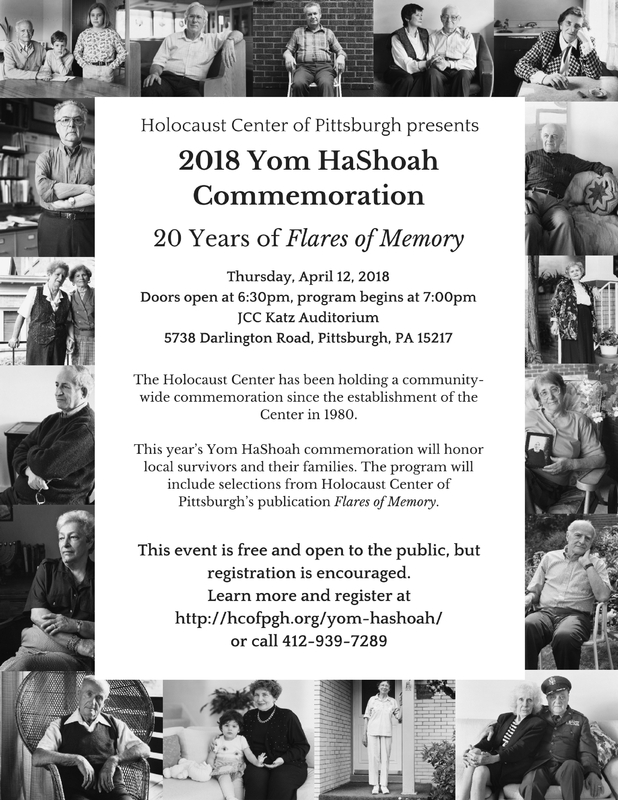 The program will include sections from The Holocaust Center of Pittsburgh’s publication Flares of Memory. Yom HaShoah, or Holocaust Remembrance Day, is the day set aside to remember the approximately six-million Jewish victims of the Holocaust. In Israel, it is a national memorial day. Yom HaShoah was inaugurated in 1959, anchored in a law signed by then Israeli Prime Minister David Ben-Gurion and Israeli President Yitzhak Ben-Zvi. The original proposal was to hold Yom HaShoah on the 14th of the Jewish month of Nisan, the anniversary of the Warsaw ghetto uprising (April 19, 1943), but this was problematic because the 14th of Nisan is the day immediately before the start of Passover. Thus, the date was moved to the 27th of Nisan, which is eight days before Yom Ha’atzma’ut, or Israeli Independence Day. Because the 27th of Nisan changes each year on the secular calendar, the date of the commemoration varies year to year. The 2018 Yom HaShoah program is underwritten by Agnes Rocher and Family, in memory of her husband George.